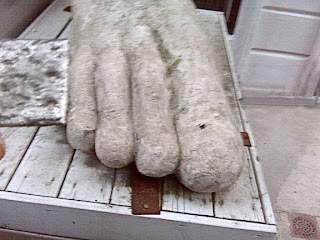 The giant 4 toed foot of the Egyptian goddess Taweret that featured prominently in the final season of Lost was discovered on 81st street near the Metropolitan Museum of Art. The Met's Egyptian collection is amazing. I don't go often enough. We just saw the Tutankhamun exhibit here in New York. Tut's at the Met too. . . And in Denver. Tut fever is spreading his collection around. It was touring back when we were kids, but hasn't been in New York for 30 years. I guess when you're immortal, 30 years isn't so long, but I'll bet Tut is going to have a hard time finding some of his old haunts.